It is a curious fact that women were prominent in the life and literature of fringe groups [of the early church]. The Naasenes claimed to have received their teachings from James, the brother of Jesus, mediated by a woman named Marianne. Epiphanius said that the Nicolaitans had a work they ascribed to a woman they thought was Noah’s wife, called Noria. The Apocryphal literature names not only Thecla, in the Acts of Paul and Thecla, but also Marianne, alleged to have been the sister of Philip, and a number of other women who were said to be prophetesses. The New Testament itself had spoken scathingly of “that woman Jezebel, who calls herself a prophetess” (Revelation 2:20). But does this mean that only deviant sects had prophetesses, or, conversely, that prophetesses were always heretical? The answer is clearly negative, since the canonical Book of Acts mentions that Philip the evangelist had four daughters who prophesied (Acts 21:9). Why then were prophetesses apparently more active in heretical groups than in the orthodox stream of the church? One can only speculate, but the following facts may have a bearing on the question. In order for the deviant groups to gain adherents, it was necessary for them to demonstrate their superiority over the established church. This was done, in part, by claiming truth the orthodox Christians did not possess or emphasize. Such “truth” had to come from a divine source, and the expected mode would be prophecy. By their nature, these groups were individualistic and lacked the established church’s corporate structure (such as it was by that time). The way was open for individual prophetic activity, which in these groups included the participation of women. 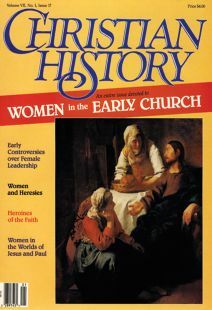 It could also be suggested that because women were increasingly restricted in the developing church structure, some of the more strong-minded or impulsive ones would gravitate to groups that allowed them more expression. .... At the heart of all this is the theological discussion among the Gnostics themselves, according to Irenaeus, as to the feminine element in Bythus, who was generally thought to be the supreme being among the Gnostic hierarchy. Some considered “him” to be sexless, while others thought he was both masculine and feminine, “assigning to him the nature of a hermaphrodite” (Against Heresies, I,XI, 5). In contrast to some of the heretical sects that developed a competing system of theology over against orthodoxy, Montanism was flourishing as an attempt to bring in a new spiritual and visionary order emphasizing the Second Coming; this order was established to counter the formalism of the church. Along with Montanus himself were two prophetesses, Maximilla and Priscilla. They were accused of leaving their husbands to follow Montanus. These prophetesses announced the imminent return of Christ and the advent of the New Jerusalem. Montanism itself was condemned by the church, but the extant pronouncements of the Montanist prophetesses, though they are somewhat mystical, do not contain outright denials of basic doctrine. These women spoke in the name of God, but did not claim to be divine themselves. On the contrary, they sought to call the church to Christ and to an expectation of His return. There are at least three ways to view the conflict between the orthodox and the sectarian practices regarding women. One is that the orthodox biblical position forbade the public ministry of women, with much of the prophetic and other leadership activity of women being thought of as simply out of order. Another view is that the more orthodox churches were in reality opposing the activity of women in the heretical sects such as Gnosticism and Montanism largely because they opposed the sects themselves.